World of Outlaws Sprint Car Champion Donny Schatz, and NLRA series regular Bill Mooney captured NLRA series victories last weekend at the River Cities and Devils Lake Speedways. Friday night at the River Cities Speedway in Grand Forks, ND, Donny Schatz won his first NLRA series feature with a last lap pass on Joey Pederson. Schatz started second and took the point from pole sitter Brian Bernotas at the start. Joey Pederson, driver of the No. 7P Dahlstrom Motors Mars MB Custom passed Schatz for the lead on lap eight and held the lead until the leaders ran into heavy lap traffic with five to go. After working the lapped traffic, and maintaining a lead for four of the last five laps. Pederson got bottled up on the final round by the lap traffic in turn one allowing Schatz to take advantage, and the checkered flag. The feature went non stop, and only took six minutes to complete. Schatz lapped up to the 13th position. Pederson finished second, Brad Seng, driver of the No. 12S S&S Transport Mars MB Custom finished third, while Pat Doar and Shane Edginton rounded out the top five. NLRA point leader Dustin Strand, in the No. 71S Q&Z Plumbing & Heating Millenium finished sixth. Steffen Snare, driver of the No. 71 Todd's Electric Swartz crossed the line in seventh after starting 18th. Troy Schill, driver of the No. 11 Forks Finest Auto Body Victory Circle came home eighth. Bill Mooney, driver of the No. 2 freehearingtest.ca Rocket finished ninth after starting 20th, and Brian Bernotas completed the top ten. Bernotas, Pederson, and Schatz were heat winners for the 24 car field. Schatz went on to win the World of Outlaws sprint car feature as well. Saturday night at the Devils Lake Speedway near Doyon, ND, Bill Mooney won his second career NLRA series feature leading all 25 laps of the main event. Bill Mooney pulled ahead of pole sitter Kyle Olson's K30 machine on the start, and lead the first three laps, before the first of many caution flags that plagued the event flew. Mooney benefited by not having to work lapped traffic, but he had to hold off constant charges from Brad Seng, and Pat Doar. After the last caution flag flew on lap 18, Mooney held off the final challenges levied from Seng to complete his wire to wire victory. Seng, and Doar finished second and third respectively, while Dustin Strand and Steffen Snare rounded out the top five. Joey Pederson finished in the sixth position, and Mike Balcaen, driver of the No. 10 Northstar Canada Victory Circle came home seventh, after starting in the 23rd spot. Tom Corcoran, driver of the No. T1 D&B Motors Rocket, Paul Mueller of Mandan, ND, and Troy Schill rounded out the top ten. Mooney, Snare, Seng, and Kyle Olson were heat winners for the 24 car field. Bill Mooney in victory lane at the Devils Lake Speedway last Saturday night. Dustin Strand retained his points lead, but defending series champion Brad Seng wittled his disadvantage to Strand down to 38 markers behind the Wissota national point leader. Joey Pederson, Mike Balcaen, and Bill Mooney round out the top five. Steve Anderson, driver of the No. 9 Hi-Per-Flex Panel Systems Pierce is sixth, Troy Schill sits seventh, Cole Schill, driver of the No. 44 Quaker Steak and Lube Rocket is eighth, Bill Michaelsohn, driver of the No. 8 Dave's West Fargo Tire Rayburn stands in ninth, and Norm Olson, driver of the No. 29 BM Transport MasterSbuilt rounds out the top ten. NLRA series action continues on Labor Day weekend with two races at the Viking Speedway in Alexandria, MN on Saturday, August 31st, and Sunday, September 1st. Mike Balcaen won his 205th feature last Thursday night at the Red River Co-Op Speedway near Winnipeg, MB. Balcaen took the lead on lap four after starting 8th in the 20 lap main event. 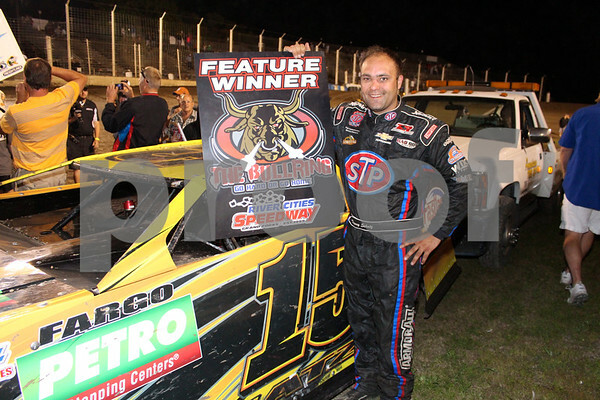 The win came on his seventh race in the previous eight nights, as he finished 7th on Tuesday at the Casino Speedway in Watertown, SD, and 8th on Wednesday night at the Brown County Speedway in Aberdeen, SD with the Wissota late model challenge series. The victory is his third of the season after victories at the Basin Speedway in Williston, ND, and his 20th NLRA series triumph at the Jamestown Speedway on August 10th. Thursdays' win also gave him a 20 point lead in the standings in Winnipeg. 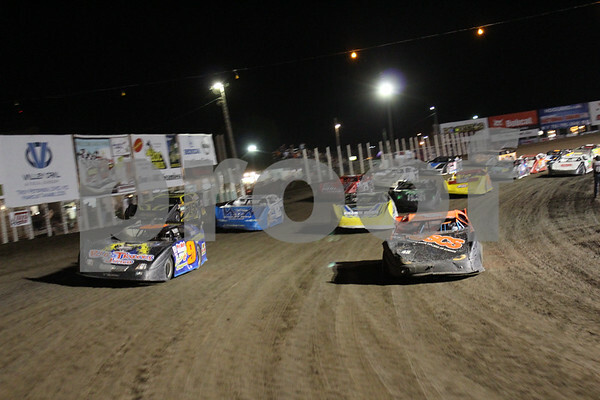 Car lining up for the start of the NLRA Feature at the River Cities Speedway last Friday night. Photo courtesy of Rick Rea, who took this picture from the box of the pace truck.